Abstract: Jax is a 12 year old QH/paint gelding that has HYPP. Recent history of “foot” issues and possible neck pain. Has never had acupuncture performed prior. He had three weekly treatment which he tolerated well but was very sore following the third treatment. History and Presentation: Jax is a 12 year old QH/paint gelding that has HYPP (hyperkalemic periodic paralysis). He receives treatment with acetazolamide. Acetazolamide has been shown to stabilized blood glucose and potassium by stimulating insulin secretion. Jax also has a recent history of “foot” issues and very mild, occasional right hind limb lameness which was localized to his hock. He injured his R shoulder during an attack a few years ago but not recently seemed affected. The owner feels that sometimes his neck seems sore. He was recently placed in four shoes which has helped. Physical Examination and Clinical Assessments: PE on 5/22/17 (only myofascial exam performed due to lack of experience with PE on horses, neurologic exam not performed but no history of neurologic deficits). Jax had at trigger point at SI-9 on the right and significant tenderness in the area of BL-21-25 on the left side. No cervical pain was appreciated based upon palpation and the “gator” manipulation. Mild sensitivity at ST-7 when pressure applied bilaterally. 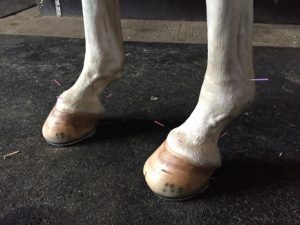 Medical Decision Making: Jax’s HYPP and lameness/shoeing is managed by his primary care veterinarian so we wanted to focus on his comfort and addressing his trigger point/areas of tenderness. We also wanted to focus on points related to the front feet and his right hock. His owner also requested that we focused on his stifles. 5/22/17- first treatment, wanted to do 6-14 points and mostly body points: GV-14, Bai Hui, bilat GB-21, bilat LI-15,16, GV-14, ST-36 bilat, BL-21, BL-23, BL-24-all bilat, severe triggers in area of BL-25 left side-could not needle, instead went 2 cun caudal, BL-25 R. Improved following treatment. Outcomes, Discussions, and References: Jax tolerated his treatment, soreness along his left bladder line improved with treatments based upon repeat myofascial exam. No other changes noted by the owner. Following his second treatment Jax was found to be sore/lame and the owner reports all limbs appeared to be involved. Recommended to give Jax at least 48 hour off following treatments. 1. Dunkel B et al. A pilot study of the effects of acupuncture treatment on objective and subjective gait parameters in horses. Vet Anaesth Analg. Jan 2017. 2. Ie Jeune S et al. 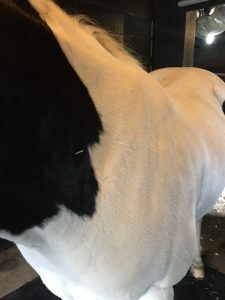 Acupuncture and Equine Rehabilitation. Vet Clin North Am Equine Pract. Apr 2016. 3. Lanscaster LS et al. 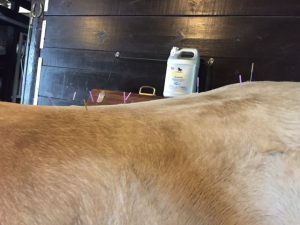 Acupuncture points of the horse’s distal thoracic limb: a neuroanatomic approach to the transposition of traditional points. Animals (Basel) Sept 2012.